A day before the launch of iPhones XS and XS Max, throngs of fans had already trickled outside Apple Stores in Asia to get their hands on the latest gadgets. In Singapore, queuers braved heavy rains to get first dibs on the new smartphones. Having anticipated the hype, Chinese tech giant Huawei sent down its staffers to give away 10,000mAh portable chargers to customers waiting outside the Apple Store in Singapore. The ‘10000 HUAWEI SuperCharge’ power bank isn’t so negligibly affordable for the company to hand out for free without feeling the pinch—it’s priced at around SG$80 (US$59) per unit. Multiply the price by the 200-odd customers who received the chargers, and you’ll have an idea of how much Huawei would have lost in sales if it hadn’t made the most of its troll—and it did. Evidently, the brand was poking fun at the 2,658mAh battery of the iPhone XS, which might seem meager in comparison with the 4,000mAh battery in its own P20 Pro. At least some Apple fans had their full money’s worth from their new buy. 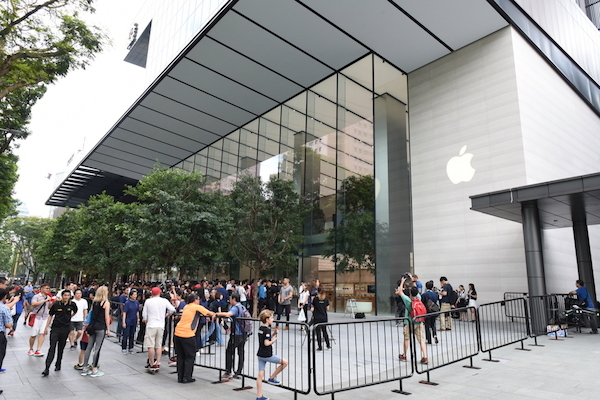 Huawei staff were spotted giving out free powerbanks to Apple fans queueing overnight for the new iPhone Xs and Xs Max in front of the Apple Store along Orchard Road. Well played, Huawei!